Several anatomic access points and methods to gain central venous access have been described. Because the upper-body approaches are generally deemed to be cleaner than femoral approaches (ie, upper-body sites are less likely to be contaminated), cardiologists, surgeons, and anesthesiologists alike have long favored them. The axillary, cephalic, and subclavian veins, as well the internal and external jugular veins, have all been used to gain central access for placement of pacemaker or defibrillator leads or central venous lines. This article reviews the techniques for gaining access to the axillary venous system for the purposes of lead placement as well as adapting those techniques for central venous line placement. To learn about other techniques for central venous line placement, see Central Venous Access via Subclavian Approach to Subclavian Vein and Central Venous Access via Supraclavicular Approach to Subclavian Vein. Additionally, subclavian access comes with the risk of inadvertently accessing the noncompressible subclavian artery and the potential for increased mechanical stress on the lead or indwelling catheter from crossing the subclavius muscle and the clavipectoral fascia. Finally, use of the axillary system, unlike use of the jugular system, does not require tunneling of the leads over or under the clavicle. A thorough understanding of the regional anatomy is essential to successful cannulation of the axillary system. The axillary vein begins at the lower margin of the teres major as a continuation of the brachial vein. It continues its course proximally until it terminates at the lateral margin of the first rib to become the subclavian vein. Along its course, it receives tributaries from the cephalic and basilic veins. The vein is accompanied, along its course, by the axillary artery, which lies slightly superior and posterior to the vein. Overlying the vein are the pectoralis minor and the clavipectoral fascia, followed more superficially by the pectoralis major. Venogram with radiocontrast delineates axillary and cephalic venous system. Brachial vein (D) receives cephalic vein (C) as it courses medially to become axillary vein (A=lower border of axillary vein; B=upper border of axillary vein). In 2003, Galloway and Bodenham published their experience in using US guidance to define the axillary system. They sought to define the reliability of US as a modality for imaging the axillary vein as well as to define the caliber of the vessel and its relation to the axillary artery. They examined 50 patients with US, taking images in the transverse plane at the midclavicular line and at 2 cm and 4 cm lateral to the midclavicular line. These images were repeated with the arm at 0º, 45º, and 90º of abduction in the supine position. Having shown the axillary vein to be a suitable target, Bodenham, Mallik, and Sharma went on to publish their experience in ultrasound-guided cannulation of the axillary vein in 2004. The authors included 200 consecutive patients in their study, all of whom were to receive Hickman vascular catheters. They placed their patients in 15º of Trendelenburg and used a 7.5-MHz ultrasound probe to image the axillary vein and artery in cross-section. The needle was then visualized in real time as attempts were made to cannulate the axillary vein. With this method, they were able to successfully cannulate the vessel in 194 patients, 76% of whom required only a single needle pass. Of the remaining six patients, four were deemed unsuitable for axillary access because of the small caliber of the axillary vein, bilateral venous thrombosis, or a very deeply located axillary venous system. The remaining two patients were not successfully cannulated after three attempts and were then cannulated successfully via the internal jugular vein. McWilliams MJ, Civello KC, Minna K, et al. Axillary vein puncture access causes a unique lead failure mechanism. Heart Rhythm. 2005/05. 2(5 Suppl):S242. Magney JE, Flynn DM, Parsons JA, Staplin DH, Chin-Purcell MV, Milstein S, et al. Anatomical mechanisms explaining damage to pacemaker leads, defibrillator leads, and failure of central venous catheters adjacent to the sternoclavicular joint. Pacing Clin Electrophysiol. 1993 Mar. 16 (3 Pt 1):445-57. [Medline]. Magney JE, Parsons JA, Flynn DM, Hunter DW. Pacemaker and defibrillator lead entrapment: case studies. Pacing Clin Electrophysiol. 1995 Aug. 18 (8):1509-17. [Medline]. Chemla ES, Nelson S, Morsy M. Early cannulation grafts in straight axillo-axillary angioaccesses avoid central catheter insertions. Semin Dial. 2011 Jul-Aug. 24 (4):456-9. [Medline]. Lin CP, Wang YC, Lin FS, Huang CH, Sun WZ. Ultrasound-assisted percutaneous catheterization of the axillary vein for totally implantable venous access device. Eur J Surg Oncol. 2011 May. 37 (5):448-51. [Medline]. Galloway S, Bodenham A. Ultrasound imaging of the axillary vein--anatomical basis for central venous access. Br J Anaesth. 2003 May. 90 (5):589-95. [Medline]. Sharma A, Bodenham AR, Mallick A. Ultrasound-guided infraclavicular axillary vein cannulation for central venous access. Br J Anaesth. 2004 Aug. 93 (2):188-92. [Medline]. Jaques PF, Campbell WE, Dumbleton S, Mauro MA. The first rib as a fluoroscopic marker for subclavian vein access. J Vasc Interv Radiol. 1995 Jul-Aug. 6 (4):619-22. [Medline]. Chun HJ, Byun JY, Yoo SS, Choi BG. Tourniquet application to facilitate axillary venous access in percutaneous central venous catheterization. Radiology. 2003 Mar. 226 (3):918-20. [Medline]. Personal Communication with Dr. Saverio Barbera. Stony Brook University Hospital, New York. Sandhu NS. Transpectoral ultrasound-guided catheterization of the axillary vein: an alternative to standard catheterization of the subclavian vein. Anesth Analg. 2004 Jul. 99 (1):183-7. [Medline]. Valencia CA, Villa CA, Cardona JA. Hemodialysis catheter implantation in the axillary vein by ultrasound guidance versus palpation or anatomical reference. Int J Nephrol Renovasc Dis. 2013. 6:215-21. [Medline]. Glen H, Lang I, Christie L. Infraclavicular axillary vein cannulation using ultrasound in a mechanically ventilated general intensive care population. Anaesth Intensive Care. 2015 Sep. 43 (5):635-40. [Medline]. Buzançais G, Roger C, Bastide S, Jeannes P, Lefrant JY, Muller L. Comparison of two ultrasound guided approaches for axillary vein catheterization: a randomized controlled non-inferiority trial. Br J Anaesth. 2016 Feb. 116 (2):215-22. [Medline]. Maddali MM, Arora NR, Chatterjee N. Ultrasound Guided Out-of-Plane Versus In-Plane Transpectoral Left Axillary Vein Cannulation. J Cardiothorac Vasc Anesth. 2017 Oct. 31 (5):1707-1712. [Medline]. Liu C, Mao Z, Kang H, Hu X, Jiang S, Hu P, et al. Comparison between the long-axis/in-plane and short-axis/out-of-plane approaches for ultrasound-guided vascular catheterization: an updated meta-analysis and trial sequential analysis. Ther Clin Risk Manag. 2018. 14:331-340. [Medline]. [Full Text]. Pittiruti M, Biasucci DG, La Greca A, Pizza A, Scoppettuolo G. How to make the axillary vein larger? Effect of 90° abduction of the arm to facilitate ultrasound-guided axillary vein puncture. J Crit Care. 2016 Jun. 33:38-41. [Medline]. Belott PH. Blind axillar venous access. Pacing Clin Electrophysiol. 1999 Jul. 22 (7):1085-9. [Medline]. Fluoroscopic image shows 25-gauge local anesthetic needle laid across intended access site prior to infiltration with lidocaine. 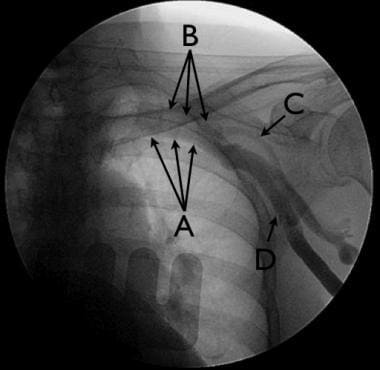 Note preferred access points at lateral margin of the first rib (A) and at point where second and third ribs overlie each other (B). Fluoroscopic image demonstrates ablation catheter advanced from right femoral vein to te left axillary vein. Note how catheter delineates location of the vein, serving as guide for accessing vessel. Fluoroscopic loop demonstrates axillary access. Needle enters axillary vein at lateral margin of first rib. Guide wire is then passed into vessel and observed to pass smoothly through axillary and subclavian veins to superior vena cava (SVC), right atrium, and, finally, to level in inferior vena cava (IVC) below diaphragm. Note presence of existing guide wire placed moments earlier in this patient, who was receiving dual-chamber pacemaker.